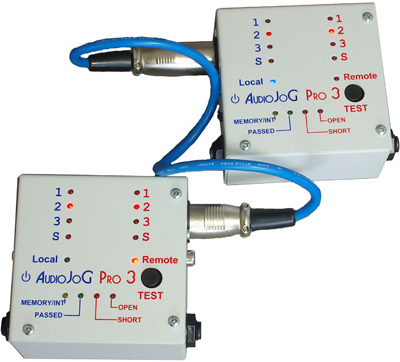 Audio cable tester with SINGLE & DOUBLE ended testing, memory and intermittent fault detection. There are 2 rows of 4 LED's corresponding to each of the possible connector pins and one for the screen (or ground) connection. As each pin is activated, the LED's indicate all connections associated with that pin, so that short, open and crossed circuits can be easily found. The LED's also show the possibility of high resistance or leakage connections. There are 4 LEDs indicating the state of the MEMORY option. 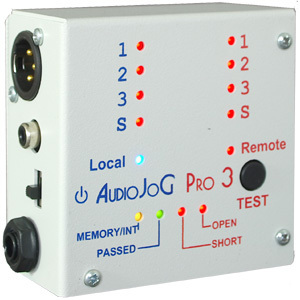 If the MEMORY LED is on then the AudioJOG Pro 3 automatically scans all the connections and compares against infor mation held with just one press of the test button. Double ended - both ends of the cable under test are plugged into the AudioJoG Pro 3. 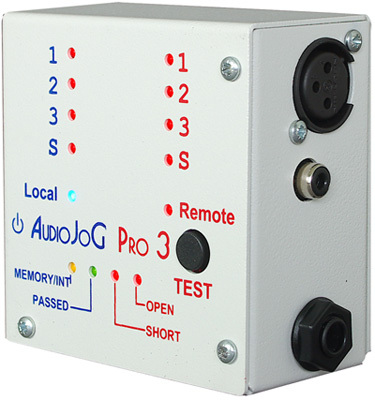 Single ended - one end of the cable under testis plugged into the AudioJoG Pro 3, the other end is plugged into another AudioJoG Pro 3 or any other compatible AudioJoG tester.